From now through 9/7 you can get a 20 lb. 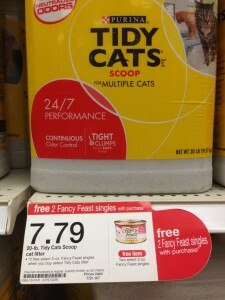 jug of Tidy Cats Litter for $6.45, plus 2 cans of Fancy Feast Single FREE. Pay $6.45 for Litter and 2 cans of cat food.